We couldn?t have been more comfortable in this lovely beautifully situated house. Everything we could possibly need was there and any questions were answered immediately by Paula the Housekeeper. We were a small party of 3 including my 91 year old Mum and found the Master bedroom was perfect for her with the walk in shower. The lift was also appreciated for her needs. The garden was a great asset and secure which meant we didn?t have to worry that our small terrier was going to escape. We cannot praise Long Commons enough and have booked again for next year. We had another lovely time at Longcommons and love St Mawes and the surrounding areas. We found the house to be a little more run down than the last few years and probably needs some attention (decorating, general maintenance and deep clean) but still extremely comfortable, views amazing and we also made good use of the garden and the BBQ. Our first impression of Long Commons was simply WOW. What a house and what a view! My husband is disabled and uses a wheelchair. The internal lift was an absolute god send and made him able to move around the house freely. The view over the bay is simply stunning. The whole house has been well thought through and all fixtures and fittings are a high standard. The house has everything you could ever need to have a comfortable stay. St Mawes is a quaint little fishing village and the locals are nice and welcoming. We will definitely recommend Long Commons to friends and family, and should we return to the area, we will make it top of our list. Wonderful views. Great location and outstanding accommodation. I would definitely recommend this property. We had a wonderful week at Long Commons it is a beautiful house in a stunning locations with far reaching views across St Mawes, the Pencuil river and around to St Anthony Head. Wonderful lawned garden with a very impressive patio perfect for alfreco dining and BBQ's, the interior was equally impressive and the wet room with double shower off the master bedroom was superb. Our only complaint would be the cleanliness of the property, we had to put all the cutlery, many of the plates and glasses through the dishwasher before we could use them once this had been done all was ok. We would definitely recommend the property and have another holiday there again. Nine of us stayed at Long Commons for Christmas. What a fab House with wonderful views. We didn?t want to leave. Plenty of room for us all and lots of bathrooms it was perfect! We were supplied with a tree and Xmas wreath which was lovely. Can?t fault our stay at all. Would love to return. This was our 5th stay at Long Commons - which speaks for itself! I particularly appreciate the lift, and the general suitability of the property for people with disabilities. We hope to return again next year. This was a super family holiday for four generations. The upstairs living room with balcony provides a wonderful place to just sit and enjoy the view, especially good for the elderly members of our party if they did not feel like going far. The balcony is also very safe - the toddler in our group found it a constant source of entertainment without us having to worry about his safety. The lift provided access for the less mobile (you need to request use of the lift in advance). The house is very well equipped - all we could wish for. St Mawes is beautiful, friendly and welcoming. A very enjoyable stay at long commons. It's is very well equipped large comfortable house. The full sky package on the TV is a very nice touch. It has good views of the sea below and a large garden for children to play. We thoroughly enjoyed our stay and booked for the following year before leaving. Thanks Cornwalls holidays for a greasy house which helped make our holiday. If you are thinking of staying here then all I need to say is three words.........just book it!!!! You will not be disappointed, this place is amazing and we have now booked our return stay for the third year.....it is great. Thanks Long Commons for another amazing holiday. Excellent accommodation, well stocked kitchen, comfy beds. Minor niggle, perching stool and toilet seat handles not adjustable enough. ie could not make them higher. What a fabulous place in a superb location with views across the estuary. The house has everything that a large family needs. We were 6 adults and a 4 year old so en-suite rooms all round matched what we needed perfectly. The upside down layout makes best use of the superb views and with a huge kitchen/diner/lounge so much family time was spent together. With full laundry facilities along with a full array of outside eating crockery and cutlery and games equipment you would be hard pushed to find a place better equipped than this one. We took a telescope and spent many evenings watching the stars and ISS overhead. Long Commons provided an excellent place for a family gathering. Well equipped for sleeping, entertaining and feeding a large group! A lovely garden, and wonderful views of St Mawes. Easy walking distance of town, castle and beaches. From the moment we arrived we knew we had made the right decision. Well equipped and breathtaking views. 3 double bedrooms had breath-taking views across the garden over to St Anthony's. The other 2 had views of the drive which weren't so exciting but quiet. The house was excellent with just several points needing attention. The vanity unit 1st floor bathroom was impossible for a person restricted to a wheelchair - too high. Too often the wc had to be cleaned thus I feel a more sophisticated model should be considered. The dishwasher needed cleaning the rim around the drop down door. However notwithstanding the foregoing we would visit again. We were very impressed with Long Commons and St Mawes. We were lucky to have good weather which allowed us to do all the local coastal walks we wanted to do. My wife and I both said we would have liked to have stayed for another week as the whole experience was a pleasure and totally relaxing. This was our third visit to Long Commons and once again we had a thoroughly good week in this beautiful house. It has been refurbished recently, and the pictures on the website aren't up to date as yet. Gone are the lovely leather armchairs sadly, with low squishy replacements. On the plus side, new beds, new bed linen and new towels all added to the comfort. As ever, the lift was so useful. St Mawes is a very pleasant place to stay and we enjoyed our daily wander down to the village. The Roseland peninsula has so much to see and do and I 'm sure we'll be back again next year. We all had a wonderful stay at Long Commons, the house is superb with bathrooms for everyone and the kitchen is equipped with everything you could want. The views from the house and garden make you want to just sit and watch life on the water. I would not hesitate in recommending this property but would add that the walk down into St. Mawes and back up again can be challenging. Place was wonderful with truly superb facilities and views. The seven of us had a great week with so many attractions in the area to visit and that Long Commons was the perfect base to strike out from each day. Only downside was the fact that we were given the wrong combination to open the key safe on arrival. Being Easter Sunday the caretakers, owners and Booking Agency did not answer their phones so 45 minutes of number combination attempts finally revealed the correct code. Once inside we were truly amazed at the quality of the premises and would have no hesitation in returning here. Beds were very comfortable and with en-suites to every bedroom along with a TV in each bedroom as well as full SKY TV system in the main living room. We were pleased that we brought a telescope with us as the night sky was fantastic. Reply from Cornwalls Cottages We are delighted you enjoyed your stay and the delights of Long Commons. Unfortunately we had not been informed of the key code change by the owner, who was mortified and hugely apologetic. However your early arrival considerably before 4pm did mean that the relevant people were regrettably not available to help you. We do our best to be available to all guests checking in, in case of any problems, as do the housekeepers. We hope to welcome you back to Cornwall again soon. Long Commons is a beautiful house in a fantastic location. More attention to detail is needed with the cleaning of bathrooms and kitchen. A sweeping brush would have helped and info on what to do with recycling/rubbish. Our week at Long Commons was a huge success. The property was spacious, clean and wonderfully equipped. The views, being above the village, were superb. The short walk down to the harbour kept us fit and St Mawes is a pleasure to relax in. The owners were extremely helpful and obliging to us. We were very sorry to leave. If one is being picky, the bed linen did not match up to the quality of the rest of the house. We certainly hope to return. We went as a couple for a break away, but you could easily have 9 people in there and not be on top of each other. This is the first time we have stayed at St Mawes and is a great little village. The house is perched at the top, there is a cut through the hotel tresanton which is 137 steps - I would advise using this on the way back up as the roads are pretty steep. There are great walks nearby and you can get the ferry to Falmouth which runs every half an hour. The house itself is equipped with everything you require, the wifi is good and all the bedrooms had good sized TV's. It has lovely views and modcons you would expect. The only thing we thought was the cutlery needed a bit of updating - but a plate is a plate. We would stay there again if we ever got the opportunity. Apart from the rain on the last day of our stay,there are no complaints whatsoever! The house was clean,bright,airy and comfortable.All of the furniture and electrical equipment were of a very good standard.The garden is well manicured and maintained by a very competent team.The views from both the house and the garden are superb.The owners made themselves known to us early in the visit and had we experienced any problems we are confident that we would have had any trouble sorted out.It is obvious that they have gone out of their way to make this place safe,warm and welcoming . St.Mawes is a busy coastal village with many amenities and the ferry to Falmouth is a refreshing change to using road transport. We thoroughly enjoyed our week's visit and regret that we could not stay longer.We hope to return sometime! High standard of accommodation - spacious, light and the house has been designed to a very high spec. 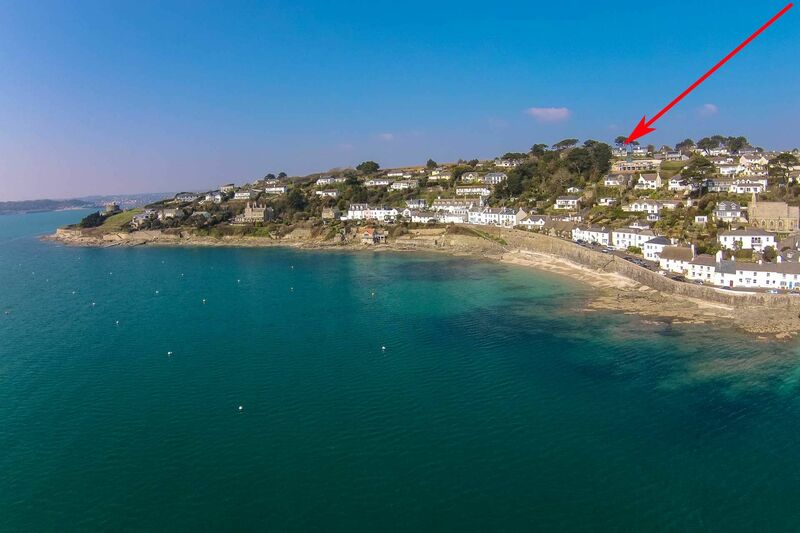 Its location is excellent: whilst it may not be in the centre of St Mawes, the harbour and shops are entirely walkable and the views that you get from the property's elevated position are breathtaking. The owners made us feel very welcome, leaving some delicious treats for us upon our arrival (wine, chocolate, biscuits), and popping round on the first morning to check that all was well. The disabled lift made a huge difference to one of our party who has limited mobility. At first glance the property was clean, but there were a few niggles, mainly things that would not be apparent to someone coming in to clean on changeover day. For example, some of the equipment in the kitchen needed washing before use, there were some food scraps on the edge of the kitchen carpet where it meets the cupboards, quite a few spotlights in the lounge and landing areas did not work. Having said this, they were all small things - cleaning kitchen equipment is almost always prudent, if not necessary, when staying in a self-catering property - we had a wonderful time and are most grateful to the owners for making us feel so welcome. The property had everything we needed. An excellent standard of accommodation within a few minutes walk of St Mawes. Plenty of parking space for several vehicles. Lovely views for a relaxing holiday. Excellent standard of outside furniture and we enjoyed a few barbeques in the lovely garden. 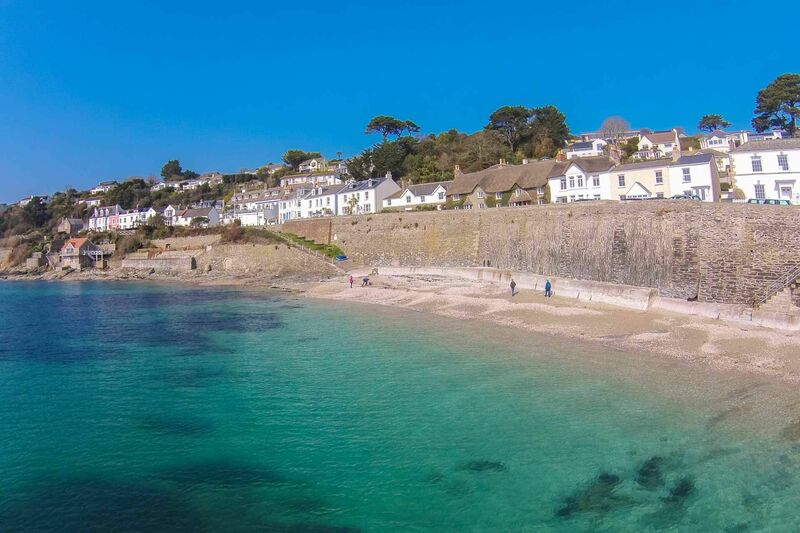 Long Commons is an excellent base for a holiday in the picturesque village of St Mawes. It is in a quiet location, within walking distance of all the village amenities, with spectacular views. 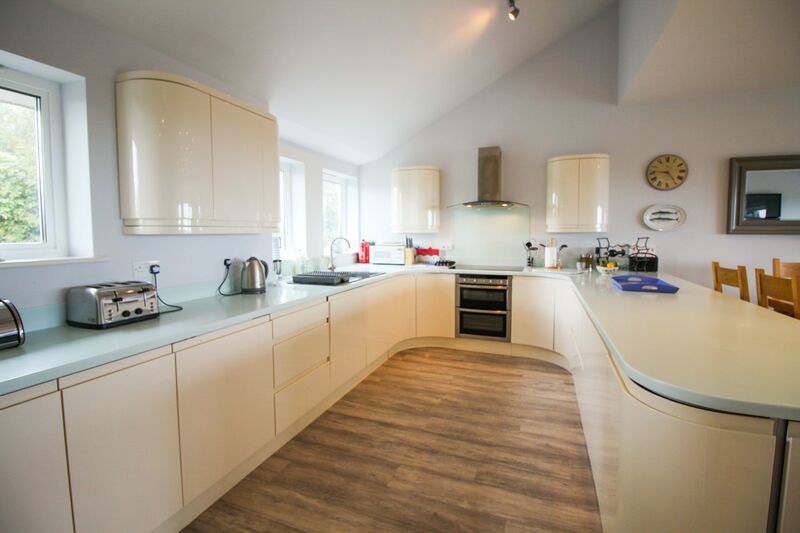 The house is a modern, high spec design, light and airy, very comfortable and clean. The kitchen is well equipped. 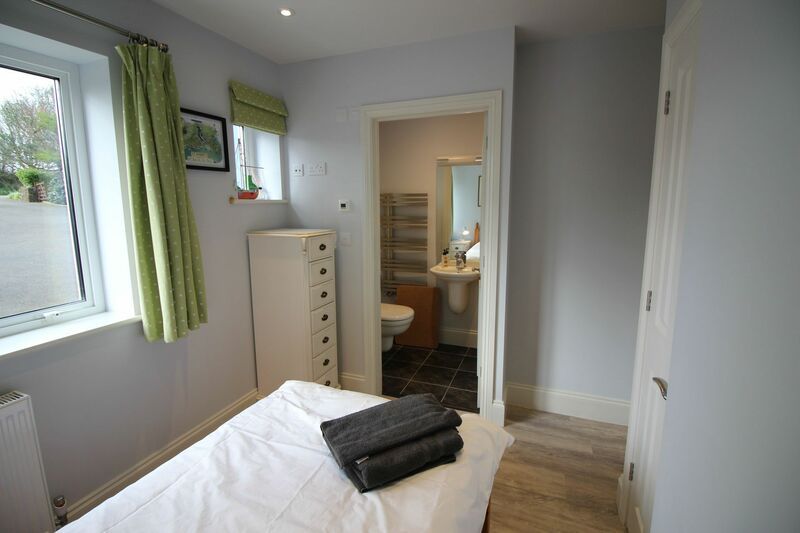 For us, the accessibility was a huge bonus - the lift and adapted shower room were much appreciated, and the welcoming and friendly owners sourced extra equipment on request. It is a very relaxing environment - what could be nicer than sitting up in bed, sipping coffee, and gazing at the boats bobbing in the harbour below? We all hoped this would be the first of many stays at Long Commons. We stayed for a week in Long Commons - a wonderful house in an idyllic location. Wonderful views from the house especially two bedrooms. Loved seeing the sun rise every morning. Well equipped, everything you need - loved having the gas bbq and dishwasher as made life easy. Quick walk in to st mawes - not so quick walking back up the hills! Also take a torch if youre going to walk back at night - not much street lighting but perfect for viewing the stars! The Idle Rocks makes a perfect place for sundowner cocktails each night! Would highly recommend and cant wait to return. What a wonderful stay at Long Commons in St Mawes. The house is wonderful with all mod cons that you could ever require! The view across the Estuary is breathtaking from the lounge balcony and garden. The owners have put a lot of thought into all the extras they provide to ensure your stay is perfect, our little one loved all the toys which were available to use in the house. We even had fab weather which was an added bonus!! A well enjoyed holiday in a lovely house and would recommend to anyone. We have a great time at this property and would look to book again. The view is just wonderful and it is close to the town and harbour even though the walk back is up hill. The kitchen has everything you need for cooking and we used the barbecue a number of times. St Mawes has a very good butchers. We cannot wait to book again. Lovely house in a fantastic location. A really great place to stay to celebrate a 50th anniversary and two birthdays The garden was lovely and very safe for the children. Long Commons is a fabulous place to stay. The location is perfect, only a 10 minute walk from the sea front but with a lovely big garden and amazing views. The house is perfect for a large family. It is always spotless, warm, comfortable and very well equipped. 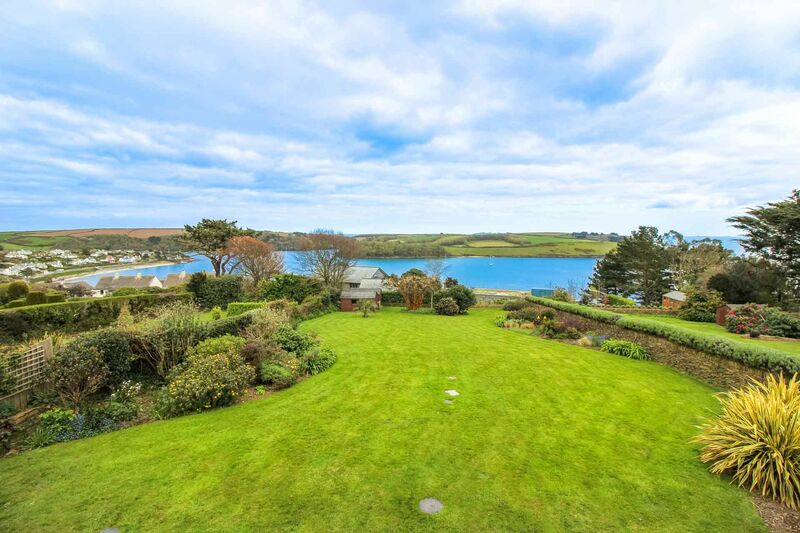 A lovely house with stunning views and well situated for the centre of St Mawes. The owners, Paula and Leslie, were extremely helpful and quickly sorted out any problems we had. We felt that the bed in the upstairs bedroom was both uncomfortable and too small. There really should be a 6ft bed in this master room. My wife being disabled also found that having carpets everywhere did not make getting around in a wheelchair very easy. Otherwise the house was well equipped and we would return. A wonderful house in a beautiful setting, you couldn't ask for more. Exceptionally well equipped and Leslie & Paula were extremely helpful. Recommended! A very spacious & modern house with fabulous views across the 'Fal river estuary' & beyond, well maintained property with lovely landscaped gardens, ample out door furniture for relaxing when the weather permits! Gas bbq a nice touch. We would certainly return, perhaps for a longer stay in the future. We were very happy with our stay at Longcommons. Two things would have made it better and they were chairs to sit on in the bedrooms and shelves in the bathrooms to put toiletries on. We booked the holiday to enable us as a family ,with some special friends to visit the area of Cornwall we had come to very regularly each year when our children were growing up and which we all loved. My husband uses a wheel chair and has major mobility problems so Long Commons was absolutely perfect for us with its internal lift and disability adapted wet room with the master bedroom. The owners were very welcoming and supportive particularly checking that my husband had everthing he needed. The house is wonderfully situated with spectacular views and having the main communal areas on the first floor we were all able to benefit from these views. We were extremely fortunate with the weather which gave us wall to wall sunshine for the whole week. Fantastic house, great for children, beautiful views! we will be back! good size bedrooms and well equipped kitchen. Very accommodating owners and St Mawes is just a short walk down the hill. We booked Long Commons to celebrate my husband's 50th birthday with friends and family. The house was perfect. Clean, comfortable and well equipped. The views were stunning! The owners were extremely helpful and very thoughtful - even leaving a birthday balloon and some extra special touches for our arrival. Highly recommended property and we will be back! Stayed during the storms - owners were fantastic even bringing us cake on one of the days, we really enjoyed the house and view and would definitely stay again. A well presented property which gave us a home from home feeling complimented by the helpfulness and friendliness of the owners. Our second visit to the property this year and a third would have been scheduled had the property not already been booked. Our preferred place to stay in St Mawes. Great house, with the most beautiful views, wheel chair friendly , the owners couldn't do enough for us to make our stay a happy one. Nice walk into the town too. Wonderful place to stay and views are incredible, very peaceful and so convenient. Looks as if this will be our summer escape for another 5 years. The Roseland is a little piece of heaven. Thanks to Leslie & Paula. A lovely house with superb views and a warm welcome. Great accommodation in a great location. Well equipped for large parties. We will definitely be back. Visit no 2 in 4 weeks - says it all. Many thanks for everything once again. See you later in the year. We have had a tremendous time in this finely equipped abode. The views are tremendous and the facilities likewise. The owners have been extremely helpful. We have been blessed with very good weather and so have made ample use of the outdoor furniture, BBQ and lovely garden. Thank you Leslie & Paula. The San Francisco Hurleys have had a marvellous time. A great house, lovely gardens and and unparalleled view. Already thinking of a return booking. Cheers!! We have had a lovely time in your holiday home. Our son is disabled and the house is perfect for him. Superb views from the garden. Fabulous house in a stunning position. We have had an amazing time staying in this wonderful location. The house was absolutely perfect for us and equipped to a very high standard.. We shall hopefully return this time next year. Wonderful house in a beautiful position. Would love to live here. Weather brilliant all week. Hope to return before too long. Stunning does seem to be the word that describes this beautiful house. So well equipped and tastefully furnished. We cannot thank you enough for the use of the lift which was invaluable for the wheelchair. The garden was a joy also and the views were the icing on the cake. Thank you Leslie and Paula. We look forward to our second visit in September. Lovely clean house to come into. We have had a lovely relaxing week in this beautiful house. It has every comfort and the views are lovely. Thank you for making our stay so enjoyable. Wonderful holiday. Stunning house and view. Lovely beach at Towan. A lovely holiday had by all. Two fabulous weeks in a wonderful home. Superb views from the balcony and terrace. A very well equipped home that has been safe and homely for our young children. Thanks to the owners for making us feel very welcome and at home. We had a fabulous stay in Long Commons. The house is wonderfully well equipped and extremely comfortable. The booking service from Cornwalls Cottages was very efficient and the person I spoke to when I booked was very helpful and pleasant. We will certainly be booking through you again - possibly at Long Commons later this year. The view from the terrace is stunning. The house is super cool and comfortable. Really enjoyed my stay. Breathtaking views with spacious interior and top of the range facilities. I was on holiday to explore but when I saw the house I didn't want to leave. Hope to return. Located on the western side of St Mawes, just a short walk from the Castle and close to the superb Lamorran Gardens, Long Commons is a large luxury house offering amazing panoramic views across St Mawes Bay, St Anthony's Head with its ever changing scenes of marine activity. Constructed to the highest specifications, Long Commons features under floor heating in the luxury bathrooms, amazing bi-fold doors at both ground floor and 1st floor level onto a balcony. The house is set out in reverse style with the kitchen / living / dining room and master bedroom located on the 1st floor to take advantage of the magnificent views. There is a sizeable south facing patio and a wonderful garden with plenty of space for children to run around. Please note that Long Commons has recently had carpets replaced and Amtico wood effect flooring installed. New photos will be available early in 2016. The biggest attraction of Long Commons is for those looking for ease of access. 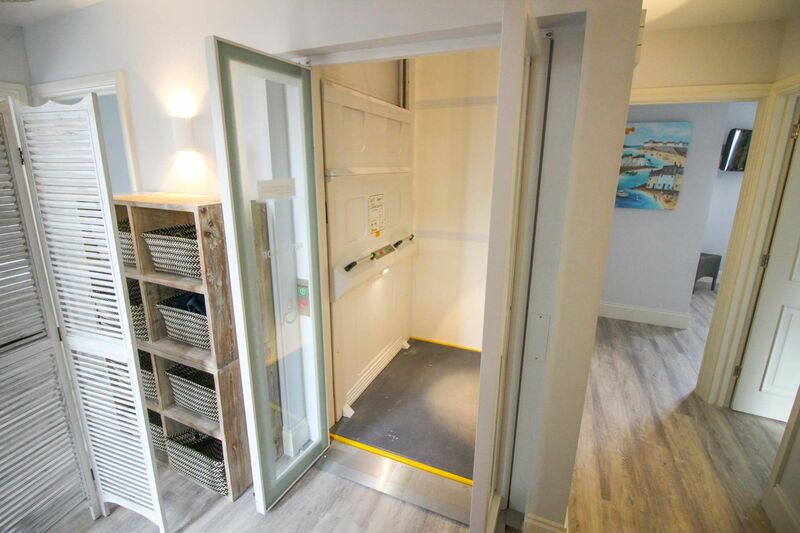 There are full disabled facilities throughout the house and there is the huge advantage of an internal lift to ensure everyone can appreciate the magnificent views from the first floor. Ground Floor: Large twin/double bedroom with zip and link beds (making a 6' double bed) with sea views, bi-fold doors and an en-suite shower room & WC. Double bedroom with 5' bed, sea views and en-suite bathroom with over bath shower & WC. Twin bedroom with en-suite shower room & WC. Single bedroom with en-suite shower room & WC. Garage with utility room. First Floor: Main open plan kitchen / dining / living room area with bi-fold doors onto a balcony with magnificent sea views with external small table & chairs. Master double bedroom with 5' bed and bi-fold doors onto the balcony with en-suite shower room with full disabled facilities, seat & WC. Separate WC. Exterior: Garden with raised patio with external furniture (including a table and seating for 10), BBQ (charcoal not provided) and sea views. Heating is via central heating and electric fire in the living room. The kitchen has a range of equipment. There is an electric oven and induction hob, a microwave, toaster, kettle, fridge / freezer, dishwasher, washing machine and tumble drier. The sitting room area has a flatscreen TV, DVD player, Sky TV and CD player. There is WiFi available at the property and a TV in each bedroom. There is an iron & ironing board. Electricity, heating, bed linen & towels are all included but you will need to provide your own beach towels. Parking facilities for up to 6 vehicles. 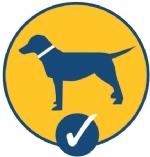 Up to 2 well behaved dogs are permitted at the small additional charge of £30 per dog per week. Strictly no smoking allowed. There is a high chair and travel cot available - please note the wooden cot pictured is no longer at the property. There are fixed wooden stairgates at the top and bottom of the stairs.